1. 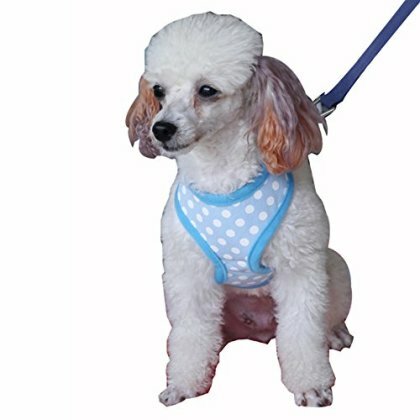 BEST HARNESS FOR DOGS - Eliminate tugging and pulling on your pup's neck and enjoy walks on the street or park - worry-free! Easy release clasp for quickly putting on and taking off harness. 2. MATCHING LEASH INCLUDED - With your harness you'll also get one matching leash that attaches easily with a metal clasp - included absolutely FREE! 3. DESIGNED WITH DOG COMFORT & SAFETY IN MIND - No-Pull vest is made from breathable comfortable 100% nylon and polyester - the ULTRA-SOFT padded construction ensures comfort for your dog at all times. 4. STYLISH, DURABLE, LIGHTWEIGHT - Stylish design to keep your dog on the cutting edge of harness fashion. State-of-the-art & lightweight design means your pet feels free and agile - Durable construction will last you for years to come! 5. Ideal for SMALL and MEDIUM dogs - comes in S, M, L, XL sizes, please refer to size chart for specific measurements. Available colours include Black, Pink, Blue and more!